Enjoy Beef Jerky is a brand produced by Enjoy Foods International, which has been around since 1971. For quite awhile Enjoy produced some of the best commercial jerky in business, and was one of the biggest brands on the market. In 2000 & 2001 it hit financial difficulty and eventually fell into the hands of a receivership. Today, it continues to operate under Saab Enterprises, which does business as "Enjoy Foods International". 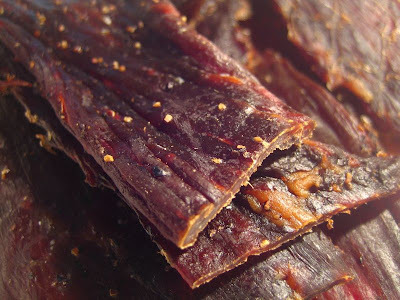 Saab makes the jerky themselves in their own meat processing unit, and also produces the "Hickory's Best" brand. The Enjoy brand is still being sold in select convenience stores and markets in rural areas, as well as in large urban areas within such stores like Sam's Club, Smart & Final, and Food 4 Less. It's also made without preservatives. Beef, soy sauce, water, brown sugar, garlic, pepper, lemon juice, smoke flavoring. The first taste I get off the surface is the smoke flavoring, with maybe a slight bit of black pepper taste. Moving into the chew, I can get a good deal of salty flavor, some soy sauce flavor, some of the natural meat flavors, and more of the black pepper. The surface taste is mostly dominated by the smoke flavoring, which is not really a strong flavoring either. Otherwise, the surface presents little taste. It's when you get into the chew that all the flavor comes out. The chew is largely dominated by the salty and soy sauce flavors. The salty comes out right away, while the soy sauce becomes more discernable half-way into the chew. 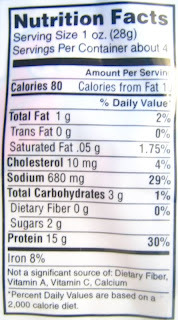 Some of the natural meat flavors are there, but are largely hidden behind the salty and soy sauce. For being preservative-free, the meat doesn't have a stale taste, though its flavors are not necessarily of any pleasing variety either. It'd be like going to a barbecue shack and ordering the "all you can eat beef ribs", and finding out it's all the low quality stuff. For being advertised as a peppered variety, it certainly does offer a good deal of black pepper taste. However, most of that peppery goodness is realized as a strong aftertaste in the back of my mouth. But there is some pepper to be enjoyed on a piece-by-piece basis. I'd say it does live up to its billing as a peppered variety. There's also very slight "waxy" aftertaste in my mouth, that you might experience after sucking on a Crayon. I'm wondering if that's produced by the liquid smoke. Overall, this is a salty and soy sauce flavored jerky, with more emphasis on the salty. With the natural meat flavors being light on taste, you're largely buying this for those two flavors, but enhancing it with the spiciness of black pepper. It's a thin dry jerky that retains quite a bit of flexibility when bent against the grain, but will easily crack apart when bent with the grain. I find that stripping off some grains requires some effort to do. Chewing can be tough it's a bit more easy if you take your time. You can't really bite this stuff off against the grain. I do see some spots and streaks of fat here and there, but not in any significant amounts. I didn't encounter any chewy tendon or gristle. 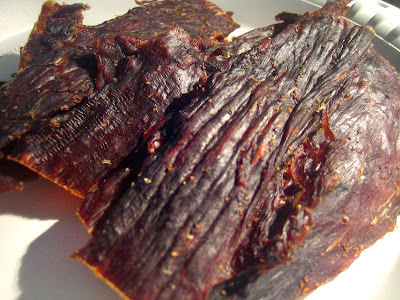 For the most part it's a lean jerky, in thin slices, but is rather tough. I paid $5.99 for this 3.65 ounce package at a general store in Pine Valley, CA. That works out to a price of $1.64 per ounce, putting this into the average price range. For general jerky snacking purposes, I'd give this a decent value. It does offer plenty of taste, mostly during the chew. However, the snackability of this jerky is compromised by the tough meat consistency, and the salt-scorching I get after several pieces. As a black peppered variety, it presents a good value. You'll definitely enjoy a strong pepper aftertaste in the back of your mouth, though the peppery flavor on each individual piece is not as strong. I couldn't quite get a good deal of snackability out of this due to the tough meat consistency, and with the high level of salt wearing me down. I could have given this a higher rating had it offered an exceptional taste, but it didn't. It's largely a soy sauce taste. There's enough black pepper here to be enjoyed, and enough to break up the monotony of salty soy sauce, it's just that the tough chew and salt scorching takes a lot away from its snackability. Moreover, it doesn't present much natural meat flavors either. Had it offered a good tasting meat flavor, and a well discernable one, that would have brought this jerky above its negatives, to perhaps a good rating. Otherwise it appears that Enjoy Foods International is still doing well enough on the strength of its brand name to get its products into the hands of distributors and into the display racks of small town convenience stores. I'd recommend a light tasting beer that goes down easy, like a honey blonde ale. Enjoy has gone through a lot of changes in the last 10 years. For a couple of years, they were outsourcing, buying their jerky form a company in Texas...and it SUCKED! Loyal customers like myself, have been dragged along, forced to endure these changes in the product. Sometimes it was so bad, I would send the whole case back! Most recently they seem to be back on track and making a product very similar to the one I grew up with in the 70's. I suggest the 32 count jars, as for some reason, the quality ant taste are mor consistent in the jars.